Looks like the family is in trouble. It looks like the cast of one of the biggest movie franchises of all time are a getting a little fast at becoming furious. Yep, after the Dwayne "the Rock" Johnson posted one of his iconic inspiring Instagram shots working hard at what he affectionately calls his "GSD (getting s**t done) table". Many productive meetings and big business deals have been sealed with a handshake at my GSD (Get S**t Done) table that's inside my trailer. This table holds a lot of great mana (spirit/power) and energy. And if these wood slabs could talk... well it's best they can't talk for national security purposes. Great shot by @sevenbucksprod President @hhgarcia41 capturing our post meeting aftermath. Cute, and probably less than noteworthy you'd think, until you scrolled through the comments and saw his 'Fast & Furious' co-star, Tyrese Gibson had commented on the photo. 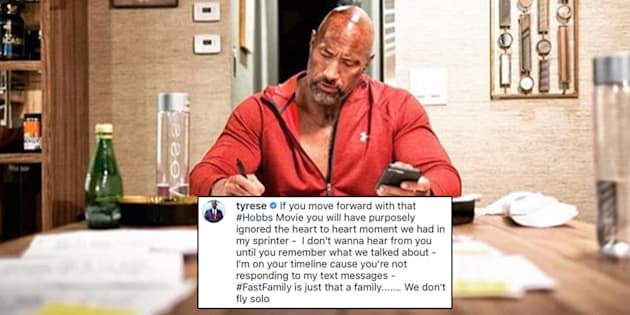 "If you move forward with that #Hobbs Movie you will have purposely ignored the heart to heart moment we had in my sprinter -- I don't wanna hear from you until you remember what we talked about -- I'm on your timeline cause you're not responding to my text messages -- #FastFamily is just that a family....... We don't fly solo." Back in April there were rumours that Universal were planning to broaden out the Furious franchise. According to 'Deadline' one of the most likely scenarios would see the characters of Hobbs, played by Johnson, and Decker Shaw, played by Jason Statham, in their spinoff. It seems Tyrese, who has played Roman Pearce in five of the Furious films, isn't too pleased with the apparent plans to move the franchise outward. This isn't the first time the Furious family has hit a rift, in the lead-up to the release of the most recent film, 'The Fate of the Furious', Johnson was the one to lash out at a co-star for their diva antics during the shoot. Johnson took aim at some of his male co-stars, refusing to name names, but calling them 'candy asses' who weren't acting professionally. After the news broke rumours began to circulate that Johnson was taking aim at Vin Diesel, who was a producer on the film. Still, this isn't the last we'll be seeing of the Furious family, with Diesel saying there'll be a ninth and tenth film in the works, aiming to release in 2019 and 2021 respectively.